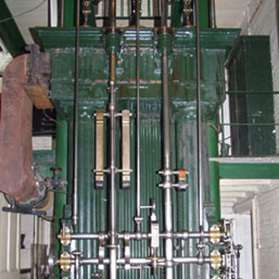 The Maudslay engine was the first beam engine built for the Kew Bridge works and began pumping in 1838. This engine was extensively rebuilt during its working life, and little of the original remains, although the original pump foundations were discovered during restoration work on the Bull Engine, which is situated in the same room as the Maudslay. The engine was built by Maudslay, Sons and Field of Lambeth, who were better known as marine engineers. The engine was later converted to work on the Cornish cycle in 1848 by Samuel Homersham. In 1888, the beam cracked and one half replaced. If you look at the beam today, you can clearly see the replacement half, which is substantially thicker than the original.